It’s that time of the month again! It’s time for Mixology Monday. This month’s theme of fortified wines (sherry, port, Madeira and Marsala) comes from Chemistry of the Cocktail. We first experienced a fortified wine cocktail courtesy of Anu Apte from Rob Roy. She was doing a Drinking Lessons on sherry, and served us an Oloroso Sour (though she included Angostura bitters on the foam as is pretty traditional for sours, and which really helps make the drink in our opinion). We’ve experimented since then, and sherry and other fortified wines have become very useful tools in our mixology tool box. They add character and depth much the same way that bitters can, plus sweetness and mouth feel, all of which are very important for making a delicious cocktail. For our submission we give you the Pleasure Vampire. The Pleasure Vampire is somewhat mis-named 🙂 It actually came about as an antidote to spending time with a really negative person, you know the type. So it is actually kind of an anti-pleasure vampire – a rich, sweet, smokey counterpoint to a bad day. But when we were joking around as Christa was mixing it, the name stuck. It was also meant to be another conveyance for Del Maguey mezcal, which both of us are very fond of. Stir first four ingredients with ice, strain into a coupe glass and add the float of mezcal. Briny, pickle-y, cured meat, smokey, faint petrol notes. Very influenced by the mezcal. Sweet start of sherry and chocolate but also has some briny notes, almost reminiscent of salted caramel. That moves into the wine and raisin flavors of the sherry with some of the chocolate bitters still carrying through, mixed with the bitter orange of the Aperol. Then the smoke and petrol from the mezcal combine with the bitterness of the bitters and Aperol to finish. This has a nice balance of sweet and bitterness and a fairly rich mouth feel. The strong savory flavors of the tequila and mezcal keep the sweetness of the Aperol and the sherry from being cloying or heavy. More grassy/vegetal notes from the agave, plus a strong cured meat smell. Funky, almost barnyard-y, but in an enjoyable way 🙂 Lots of petrol too. Like with the Minero, but more smoke, petrol and sweetness interestingly enough, and a little less brine. The Aperol shows up more, with the orange notes being a little more forward. As the drink warms up, the chocolate really comes to the fore too. 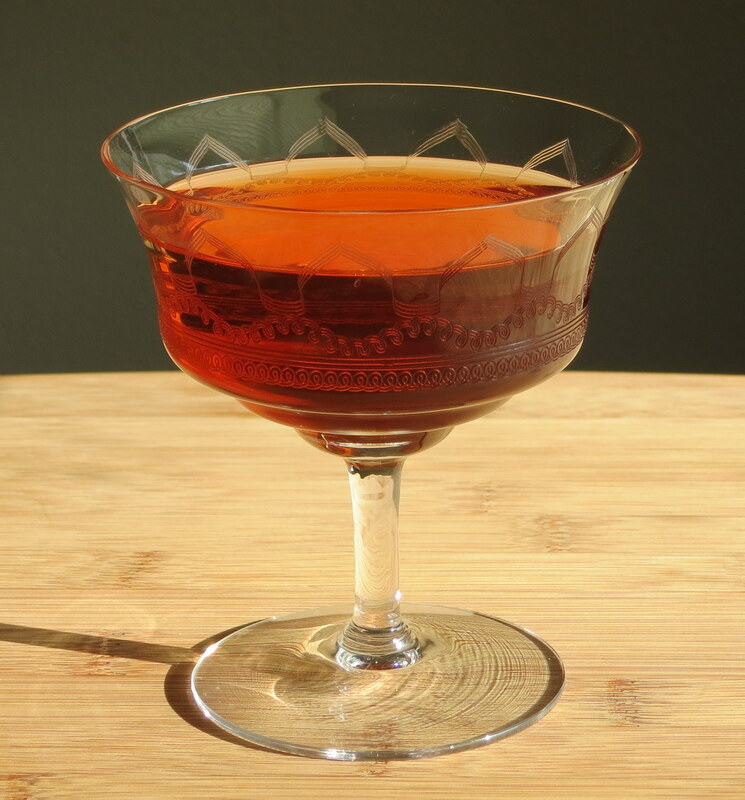 Even though this drink doesn’t feature a fortified wine as the star, we feel it shows how fortified wines can enhance cocktails in very lovely ways. In this one, the sweet raisin flavor that the sherry brings balances the herbal/petrol/smoke of the tequila and mezcal, and provides a bridge to tie in the chocolate and orange flavors of the other ingredients. Update: The round up is now posted. Go check out some of the excellent entries this month. Thanks to Jordan Devereaux for hosting this month. This entry was posted in Mixology Monday, Original Cocktail and tagged Aperol, chocolate bitters, del maguey mezcal, Mezcal, Mixology Monday, pleasure vampire cocktail recipe, scrappy's bitters, sherry cocktail recipe, Tequila, tequila cocktail. Bookmark the permalink.